All our projects are located along this 10 km long beach. 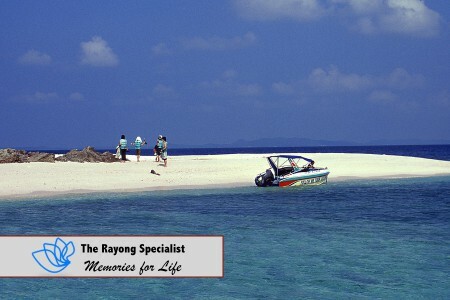 There are many small beautiful islands outside Rayong. Here you can go snorkeling or diving, enjoy the beaches and go swimming, and enjoy the unspoiled nature and local culture. Prices: Ot’s only around 100 Baht for the ferry to Koh Samet. You can hire a speedboat to the other islands for around 3,500 to 6,500 Baht for a boat that can carry from 5 to 20 people depending on price and size. If you share in a group, you can go on a cheap day on the water. 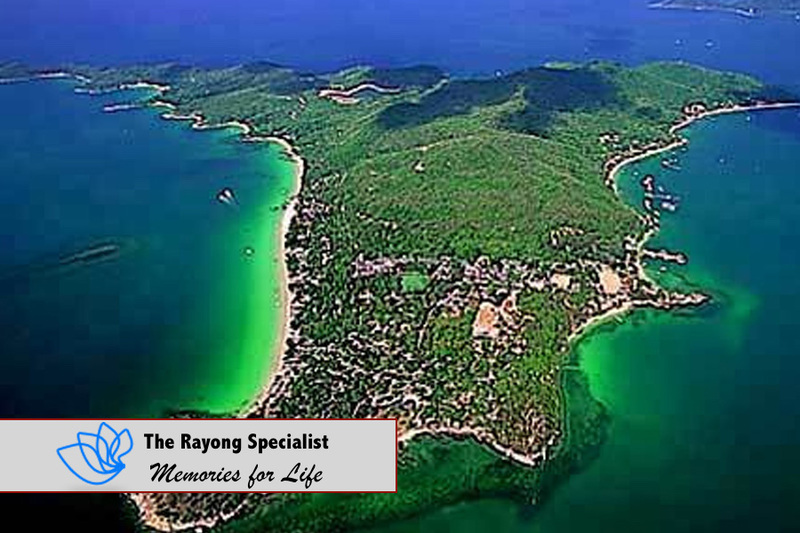 The local national park is called Khao Laem Ya and is located on the island Koh Samet. It’s an area of around one square km. 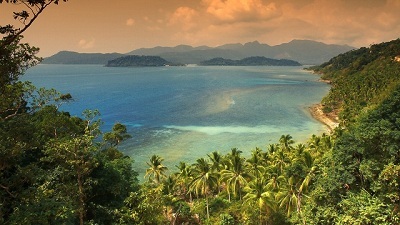 There are mountains covered with forests right down to the beautiful beaches. Prices: Take the ferry from the town of Ban Phe to Koh Samet for around 100 Baht, but access is easier from the sea, so rent a speedboat for a more convenient trip. A speedboat costs from 3,500 to 6,500 depending on size and number of seats. 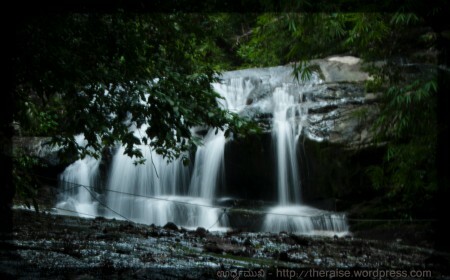 Khao Chamao water fall or Namtok Khao Chamao water fall is found around one km before Khao Chamao – Khao Wong National Park. The water is crystal clear and the fall covers seven stages or a three kilometer stretch. It’s near the center of the park. It’s about 65 km from Mae Rampheung Beach, or one hour by car. 8:00 am – 17:00 pm. Khao Wong cave is inside a mountain at a steep rock covered with trees. You can also find exotic plants like Dracaena loureiri and Malayan trees. 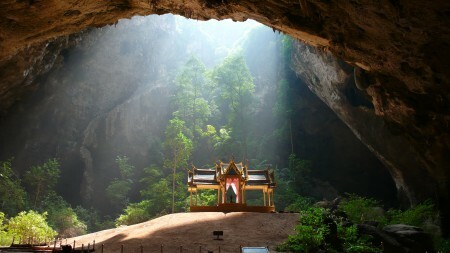 Inside Khao Wong you will find more than 80 lime stone caves. It’s located around 65 km from Mae Rampheung Beach, around one hour by car. Rayong has had a great influence on Thai history, because the people took part in saving the kingdom today known as Thailand. 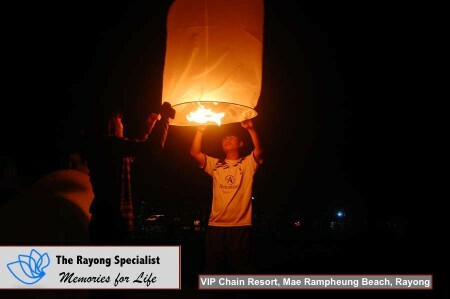 The temple is located in the center of Rayong city, just 10 minutes from Mae Rampheung Beach. The giant statue is in memory of the king Taksin back in 1767. 6:00 am – 21:00 pm. 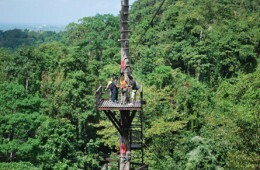 An eco-nature attraction with an area of 2,000 rai. The Park Adventure Land has fruit plantages, rubber tree gardens, Rusa farms, water streams and attractions. It’s surrounded by mountains perfect for activities like bicycling, rowing, swimming – or just go for a long walk. It’s about 40 minutes by car from Mae Rampheung Beach. 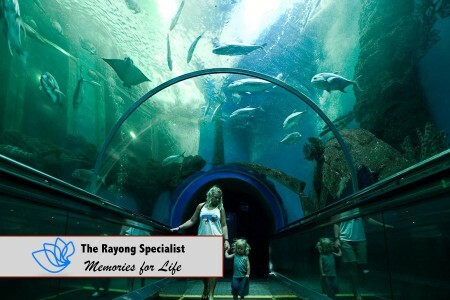 In the small fishing town of Ban Phe near the end of Mae Rampheung Beach Road you will find Rayong Aquarium with lots of different kinds of fish. It also features an underwater walkway. Perfect for a family trip. This used to be the longest zip line i Asia, and it maybe still is with its 3 km of lines going down through the jungle on the hillsides. It’s only a fre kilometers from Mae Rampheung Beach, or just around 10 minutes by car. A thrilling but perfectly safe adventure for anyone not scared of heights. 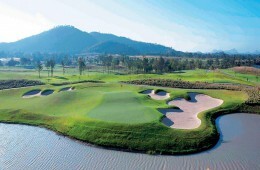 Golfing is cheap in Rayong compared to other locations in Thailand. A PSC membership of 2,900 Baht gives access to 20 courts. The green fee is around 500 Baht. Petri – a small local mini mart selling products from Scandinavia. 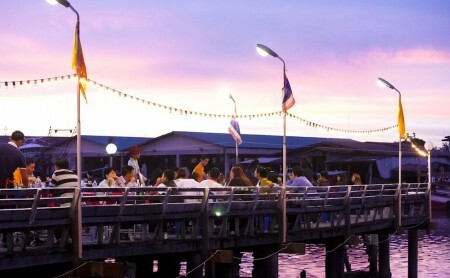 Koh Kloi market is a fantastic place in Rayong located at the highway to Bangkok, road number 3. It’s a floating market built in an antique style. 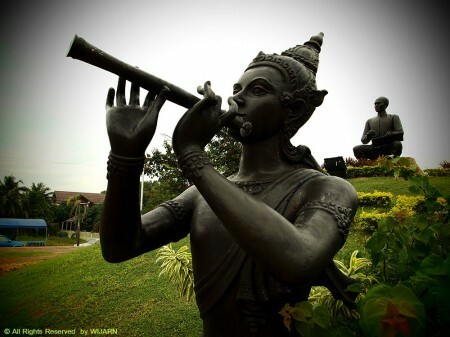 A statue of Sunthorn Phu Phra Chedi Klang Nam, who was a very popular local poet. Around 45 minutes by car from Mae Rampheung Beach in direction Klaeng and Trat. Combine this historic attraction with some of the other attractions on the way. 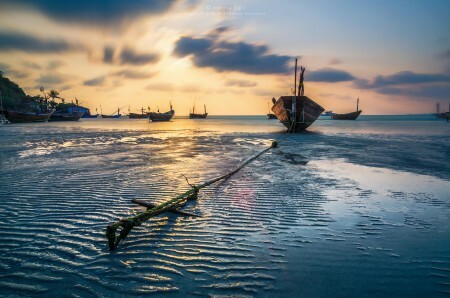 At the beginning of Mae Rampheung Beach you will find local fishermen and see the traditional way of fishing in Thailand. The location is called Ban Kon Ao. 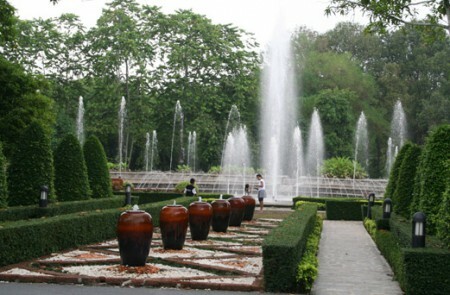 This garden was created in celebration of HRH Princess Sirindhorn. It’s a paradise for knowledge with a collection of 260 groups of rare natural medicine plants and 20 categories of old medical journals. Located on highway 3 to Bangkok. 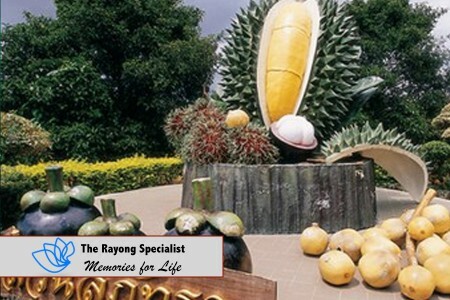 19 km from Mae Rampheung Beach you will find this big ecological fruit plantation. Crystal products are made in Rayong in very good quality. The Lotus Crystal factory is open for guests every day from 08:00 to 17:00. You will find a huge selection og home made crystal bowls, vases, trophies etc. Every single piece is 100% handmade. You will find it in the Nikompattana District around Sukhumvit in Rayong city. It’s around 25 minutes from Mae Rampheung Beach. The temple is located in the Tha Pra Du area and is Rayong’s oldest temple. It was built in 1464 by Tim, the governor of Rayong during the the Ayutthaya period. There are valuable paintings by local artists in this amazing old temple. Open every day from 08:00 to 17:00. 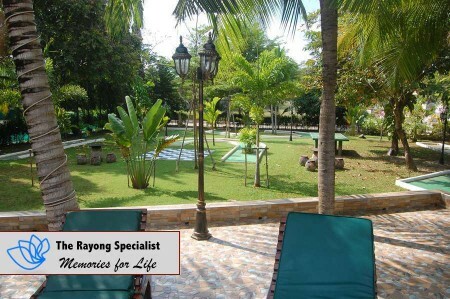 Around 20 minutes from Mae Rampheung Beach in the old part of Rayong city. Entrance is just 10 Baht. 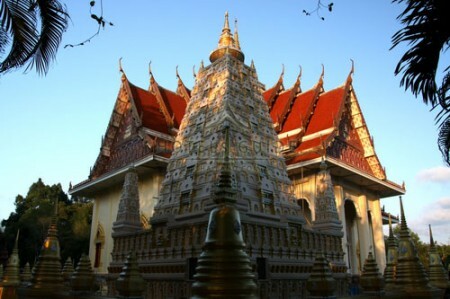 The biggest temple is located in the city of Klaeng and was built in 1944. 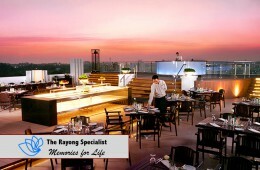 It’s not only the biggest in Rayong, but one of the finest in the eastern part of the country. It has been used as a model for many other temples in Thailand, but none of them as big as this temple. It’s around 25 minutes by car from Mae Rampheung Beach. 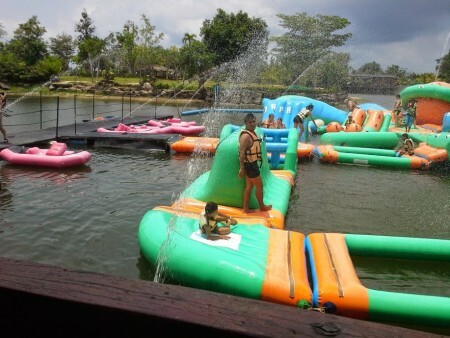 Only a few kilometers from Mae Rampheung Beach you will find a small water park named Tamnanpar. It’s only about five minutes from the beach road. Bring the kids! 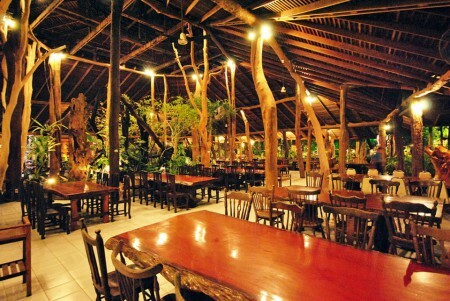 The most spectacular restaurant in the area is Tamnanpar Jungle Restaurant. When walking into the restaurant, you walk through a small jungle with birds and fish and small streams. The restaurant itself covers a big jungle area, where you sit under trees with a fantastic view of beautiful lights in the trees around you and an amazing scenery with a lake and a mountain in the background. The food is excellent as well, and not overpriced at all. Remember to take a walk in the restaurant jungle area before you leave. There’s even a small cave. 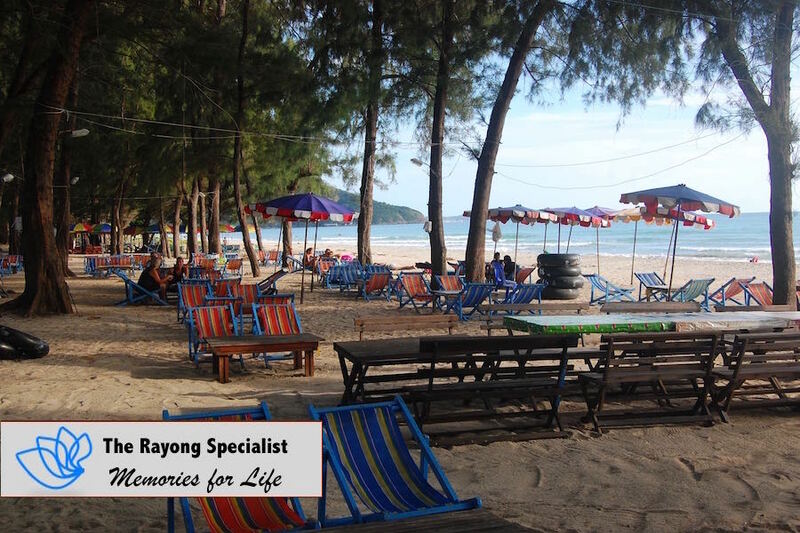 It’s just 5 km from Rampheung Beach, or just a few minutes by car. 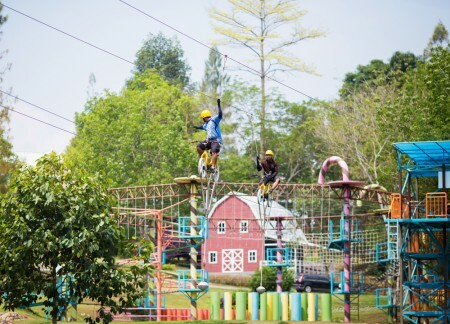 Strawberry Land is a fairly new attraction in Rayong focused on “sky riding” on a bicycle attached to cables. You will also find boats, small villages etc. 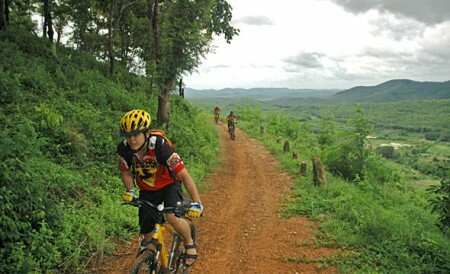 It’s located around 25 km from Mae Rampheung Beach, or 35 minutes by car at road number 3139 going inland. 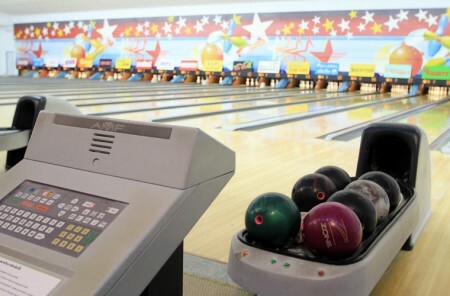 Såfremt man gerne vil have en afveksling i badeferien kan det anfales en tur forbi bowling i Rayong. Det koster kun 100 baht i timen. The big shopping malls all offer excellent bowling. Combine it with lunch or dinner in one of the many good restaurants in the malls. 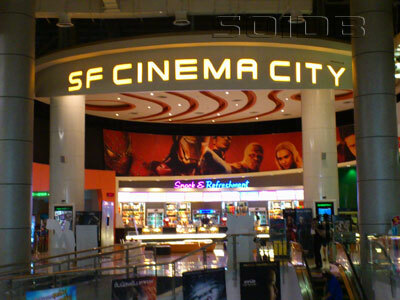 Rayong has several fully modern cinemas showing all the latest movies. Some movies are dubbed in Thai, while others are with the original sound track. Make sure you pick the right show. 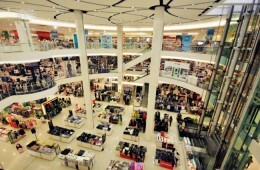 The movie theaters are located in the big shopping malls like Laemtong Mall and Central Department Store. In general, Thai movie theaters are beautifully decorated and with very powerful audio. Right before the movie begins a short video is shown to pay respect to His Majesty the King, and all visitors will stand up while the video is showing. This is a remarkable experience in itself and shows Thai culture at its heart. In Thailand you can get massage everywhere, but many smaller places don’t have staff with a real education in massage. If you aren’t so picky, then you can even get a nice massage right on the beach. If you want a more professional experience, maybe combined with spa and other treatments, then visit Apsara Spa and Massage located inside the VIP Chain Resort on Mae Rampeung Beach Road. 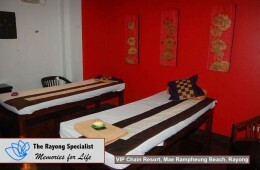 It’s a 2-storey house with its own lovely garden and swimming pool, and there is a big selection of treatments. It is highly recommended. In the VIP Chain Resort on Mae Rampheung Beach Road you will find the only mini golf lane in the area. It’s open every day from 08:00 to 21:00. It’s situated right next to the club house with a big pool, a pool bar and a great restaurant serving both Thai and western food. A great idea for a lovely afternoon/evening activity. In the VIP Chain Resort and in the Sea Sand Sun Beach Condominium on Mae Rampheung Beach Road you can ask at the reception counter if you want to rent any form of transportation. Safety first! Make sure you have or rent the right safety gear if you want to go out on your own. Let our staff advice you. And as with cars, don’t mix drinking and driving no matter what kind of vehicle you are controlling.